Large 560 piece set that’s ideal for class-based projects and continuous provision in schools. This set is the ideal resource for a single intake school that wishes to make the most of the teaching support program downloadable at u-nu.co.uk. We are continuously adding valuable teaching schemes designed for the EYFS KS1 & KS2. These simple to follow schemes provide the perfect solution to engaging children through play based learning. Designed by experienced teachers from the UK they demonstrate a working knowledge of the characteristics of effective learning, simplifying the delivery of maths, science and creativity as well as enhancing a child’s physical & social development. 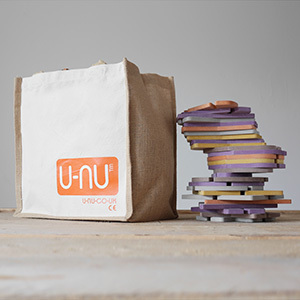 U-nu is made from a specially engineered coloured wood. It is moisture and UV resistant and is non-toxic as well as being tough. It complies with EN71 the European Standard for toys. The colour runs evenly throughout the pieces so that any scratches or marks go largely un-noticed, giving this beautifully made resource the durability it needs to provide years of service. u-nu has been designed to be a fun, flexible and indispensable resource for anyone working in the EYFS, KS1 and KS2. It's tough, easy to use and eco-friendly. Most of all, it's a beautiful looking product and a pleasure to work with.